Turkish voters headed to the polls Sunday for a second national election in five months, after an inconclusive ballot and failed coalition talks. Since June, the NATO-member country and U.S. ally has been rattled by growing security threats and political turmoil. A spate of attacks across Turkey has been blamed on Islamic State militants, including the October 10 suicide bombings on a pro-Kurdish rally in Ankara that killed more than 100 people. Meanwhile, conflict between the Kurds and the Turkish state has returned with a vengeance, following the collapse of a two-year cease-fire with insurgents from the separatist Kurdistan Workers’ Party (PKK). Here's a look at the makings of Turkey's elections. Turkey’s parliament, the grand national assembly, has 550 seats, 276 of which are needed for a majority. The head of the majority party is named prime minister and holds the real power. The role of the president is symbolic. The members of the parliament are selected from 85 electoral districts that elect different numbers of lawmakers depending on the size of their population. But each party has to get more than the national 10 percent threshold to enter parliament. If they fail, their seats are reallocated to other parties. This gives larger parties an obvious advantage. The socially-conservative political party has ruled Turkey since it won landslide elections in 2002. 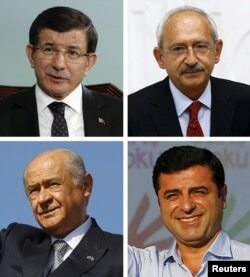 Its leader, Ahmet Davutoglu, is Prime Minister, while former party leader Recep Tayyip Erdogan is president. Davutoglu will be the party’s top candidate on Sunday. 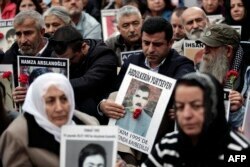 The opposition accuses the AKP of going back to its Islamist roots and tradition of authoritarianism. Established in 1923 by Mustafa Kemal Ataturk, the founder of the Turkish republic, the CHP is the oldest political party in Turkey and is currently the main opposition in the Grand National Assembly. The party leader and its top candidate is Kemal Kilicdaroglu. In the June 2015 general elections, the MHP won 16.3 percent of the vote and won 80 seats, becoming the joint-third largest political party. It is strongly against the peace process with the Kurds, and believes that Turkey’s problem is PKK terrorist activity and not Kurdish rights. The HDP was founded in 2012 as the political wing of the Peoples’ Democratic Congress, a union of numerous left-wing movements that had previously fielded candidates as independents since the 10 percent threshold only applies to political parties. The party operates a co-presidential system of leadership, with one chairman and one chairwoman, they are Selahattin Demirtas and chairwoman Figen Yuksekdag, respectively. Selahattin Demirtas (C), co-leader of Turkey's pro-Kurdish Peoples' Democratic Party (HDP), attends a gathering of "Saturday Mothers" at Galata Sarai Square in Istanbul on October 31, 2015 on the eve of the country's general election. More than 54 million people were registered to vote out of a population of almost 78 million. Another 2.9 million are registered abroad. Voting took place at 175,000 polling stations, from 7 a.m. to 4 p.m. (0400 UTC to 1300 UTC) in the east and from 8 a.m. to 5 p.m. (0500 UTC to 1400 UTC) in the west. Security was high for the vote, with 255,000 police and 130,000 gendarmes on the streets. The Organization for Security and Cooperation in Europe (OSCE) monitored the election. Jaime Dettmer contributed to this report.